I first met Jericson Co at a Chaine de Rotisseurs dinner that we attended. I was very impressed with his vast knowledge and his passion for cocktails. Subsequently, I would see him at the Blind Pig and our discussions would continue. He would even tell me to taste some of his favorite creations. A few months ago, I found out Jericson and some other partners opened The Curator Cocktail Bar and The Curator Coffee Bar as well. Both places have continued to impress with the quality and creativity of their drinks. Let us delve into the world of Jericson Co and see what makes him tick. How did your love for crafted cocktails start? I started reading about bitters and cocktails roughly around 2007 when I was in Vancouver. One night after work, I sat down at the bar of a restaurant called Boneta in Vancouver and the bartender, his name is Simon Kaulback, pretty much spent the whole evening talking to me about bitters and cocktails. That sparked something in me to push along further. Back then, I already had an unhealthy fascination for everything cooking and the craftsmanship of cocktails naturally moved along with it. Who or what were your biggest influences? Dale Degroff: Essentially the godfather of this whole thing that we’re doing. He was the one who wanted to pitch using fresh ingredients and essentially reviving cocktail culture and how to become a proper bartender. Shaun Layton and Jim Meehan: Creativity and maintaining a ridiculous level of quality while continuously pumping out new drinks. Kazuo Uyeda and Hidetsugo Ueno: The Japanese have a distinct way of working with cocktails, every movement is studied and determined, there’s a purpose and efficiency in all their action and it’s just a marvel to consider that the smallest of details are meditated on… it shows on the drink too. But all in all I’m still a Thomas Keller service and execution fanatic. He’s not a bartender, but his philosophy in service, on perfection and on having a sense of urgency; that hooked me into my love for the hospitality industry. You recently told me that you had met one of your idols, Jim Meehan recently. If he were to come to Manila and spend the day with you, where would you take him for Breakfast, Lunch, Merienda, Happy Hour, Dinner, After Dinner Drinks? Jim Meehan?! God that’s insane, Ok a couple of parameters and assumptions. First is that my goal would be to show what culinary voice Metro Manila has interspersed with showing off people that I feel, have a certain kind of integrity in what they do because people get high on seeing that level of passion. Second is assuming that traffic and a full stomach are non-factors. So, breakfast/brunch would be Mamou, in my opinion consistently one of the best executing restaurants in the country, the food’s fantastic and the service is smart, sincere and warm. I was at a talk recently that Jim Meehan gave about building family among service teams and he’ll appreciate Mamou’s set up. I kid you not when I say that it’s a family there, they do bible studies and the owners really invest in caring for their staff. It’s quite noticeable how their service unit works together and is actually really happy doing what they do. It’s a model that everyone operating in the country should learn from. Lunch would be at Bahay Kawayan in Rizal. If you want to talk about honest Filipino food and consistency without all the b.s. attached with location, restaurant design… yadda yadda it’s Bahay Kawayan. Adobong Pusit sa Gata, Pritong Hito, Sinigang na Kanduli. Tomatoes, salted eggs, green mangoes and their fish based bagoong. I’ve been going there with my family for a good 20 years now and it’s sincerely the only place in the country I’ve experienced where the moment is equally as good as the memory attached to it. Merienda would be isaw and the other unmentionable street food at UP. For the in-between, it will be coffee from the Curator at Archives (I bet he’ll love the clothes there too) it’s a great perspective into what we think modern Manila will look like. Sly and David from the Curator is possibly the best coffee guys I’ve met. These two are equally crazy about their craft and it’ll be a rush to showcase local people that have an insane amount of dedication that you couldn’t see very easily no matter where you are in the world. For happy hour I would want to show him our country’s beer culture. Buckets of Pale Pilsen mixed with pulutan. It’ll be a nice way to show how we view what is essentially an aperitif hour. Most of the grills here are good for that but I currently love this place called Bagnet at it’s Best in the Scout area, I’m actually hesitant of telling you where it is for fear of it becoming too busy. Yes, their Bagnet is ridiculous. They do it in such a way that the meat’s almost a confit and then the fat are just these majestic webs of happiness. In no universe is it good for your body but your soul will be happy. Dinner will be at this one place that I’m currently so unabashedly happy to exist in the metro: Sensei Sushi with Bruce Rickets in BF. That guy is insane, his food is courageous, wildly creative, detailed and really thought out. The level of dedication this guy has to what he does, from sourcing to execution to just pulling ideas from his head, it’s never been seen in the country and I really, sincerely, hope that there’s more people like him that pop up. I’m going to be selfish and take him to the Curator for drinks because it’s Jim freakin Meehan!!! It would be an honor to serve him. The fact that we learned from him, PDT, and his writing, it would just be a ridiculous rush to show him that among the giants whose shoulders we stand on, his is one of the ones with the most breadth. Late night? I have to thank Table for Three, Please for this, my favorite late night food is tapsilog: Maty’s in Paranaque. Ridiculously satisfying drunk man food. What are your favorite bars at the moment? Locally: we’re quite fortunate in the city to be in a time with fantastic cocktail and wine culture. Blind Pig started all of this and I just can’t be thankful and respectful enough of what they started. The service that they give is awesome, personalized, and really lovely. Drinks are fantastic and don’t be too afraid to challenge the guys to make you something interesting, they’re more than capable to blow you away. Niner Ichi Nana is fantastic too. Great drinks and these guys have wild creativity with their presentation and execution. I know they have big dreams and I’m quite excited to see what they do. I have an abundant love for hotel bars from travelling a lot, The Long Bar at the Radisson is awesome. I love the room, I love the music, I love that you can throw peanut shells on the floor. It’s one of those awesome relaxing places after a long day. Cyrano Wine Shop and particularly the company of its proprietor, Alex is quite interesting. He’s sincere, unapologetic and quite the character. Watch out for when Nino Alejandro plays at Cyrano, he’s far and away much better than a lot of the music you get lately. And lastly, every once in a while, heading to Craft Rock and Grill at the Fort Strip on a Friday when Trinidad is playing. Glam rock, loud music, lots of beer is one of the more fun nights I could think of. I just came from San Francisco and in Haight Ashbury there’s a bar called the Alembic, to be honest other bars with more specific concepts have opened and have ridden the cocktail wave that execute fairly well but holy hell, nothing beats how good, consistent and creative that bar was when I visited. These guys were the ones that started the cocktail culture in San Francisco and I was just so blown away with how smart their execution and their drinks were. I have a special love for Shanghai there are several great quiet drinking places there. The Senator Saloon near Changshu in Jing An is one of them as well as Constellation particularly the third iteration of the place near People’s Square. And of course, Japan. Particularly Bar High Five in Ginza. Call ahead, sit at the bar, and let Ueno-san make a drink for you and just watch him. He hits that magic sweet spot between being intensely focused on execution and a jovial Mr. Miyagi. He’s awesome. But like salmon finding their way back to where they were hatched, nothing beats your home bar and to me that’s L’abattoir in Vancouver with Shaun Layton making drinks for you. Please tell us what your favorite cocktails are? I like trying new drinks and favor the ones that sing loud notes but are still balanced. That being said, my go to drinks are the Aviation and the Boulevardier. Please tell us what your signature cocktail is? We like to shy away from having signature drinks. It feels too insipid, lazy and unmovable. I’d much rather prefer that we have a signature way of handling our customers to provide them (hopefully) a drink that satisfies what they’re looking for. That being said, we’re proud of a range of drinks in the Curator that, so far, we’ve been able to conjure up that makes a wide group happy. Of course, like most creativity, they’re dedicated and inspired by the people that we imagine the drinks for. Please give three tips to aspiring mixologists. I love talking about that term “mixologist”… advice to those starting up? First is to stop calling yourself one. Anecdotes I love about that are: what’s the difference between a bartender and a mixologist? Ten minutes! My favorite one though is that a mixologist serves drinks, a bartender serves customers. So further advice? Learn, read about the craft, read a lot, and allow yourself to get inspired by tastes, aromas, history, pretty much anything. Always strive for refining your palate and get to perfection but far and above all of that, understand that you’re doing this not for ego or pride but you’re doing this for your customer, you’re doing this to make people happy, never lose sight of that. Are there any books that have inspired you? Kazuo Uyeda, Cocktail Technique and The French Laundry Cookbook by Thomas Keller. They’re required readings for everyone that works at The Curator. Aside from books, tell us about your favorite magazines, films and blogs. Online, Imbibe’s pretty good as well as Difford’s guide and Class Magazine. There’s a recent movie in iTunes called Hey Bartender, that’s a pretty good film about the industry. As for blogs, cookingissues and ideasinfood are tech forward blogs that give way to interesting ideas for cocktails and new ways of approaching problems. Aside from cocktails, you also have Curator Coffee. Please tell us how this venture came about? 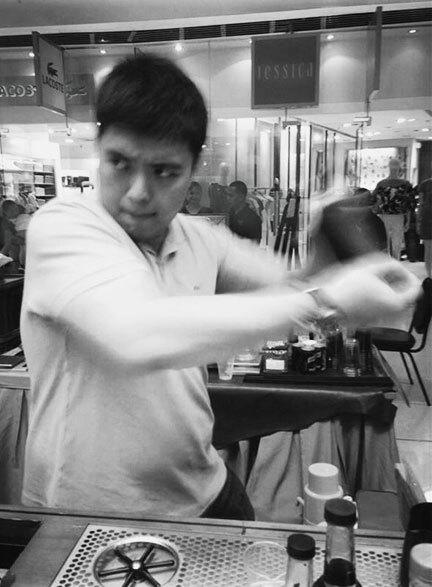 I attended a coffee class taught by Sly Samonte and that kind of ruined me for coffee. I loved every minute of it and it was actually the moment when I decided that I’ll start teaching cocktail classes which eventually became the cocktail side of the Curator. You could definitely say that he was one of the key triggers for this whole movement. Through the whole ordeal I also met David Ong and the three of us just found kindred spirits in each other particularly on craftsmanship and a respect for the process of making beverages. These guys are the best coffee people I’ve met in the country, I’m ridiculously fortunate to call them friends and partners… with all the other partners in the Curator actually, it’s just a ridiculous embarrassment of ideas, experience, know-how and passion. Let’s switch to food: What is your favorite restaurant in Manila? Bahay Kawayan. Please don’t go there. It will make me so, so sad if they start turning us away for having too much business. What junk food do you love? Is there a type of food that you just can’t seem to enjoy? I’m not a sweets person so I can’t really find myself yearning for this whole thing baked goods thing with donuts and donut derivatives. Just between us, what are your future plans? At this point, I’m happy if we can have staff meal together with our whole team at least once a week! But that being said, we want to help define what drinking culture will be for modern Metro Manila so other concepts are definitely in play. I love this place called Smuggler’s cove in San Francisco and I still want to pitch on a high volume cocktail bar that still executes well. So yes, big plans but we only want to move forward to also help our guys grow in their cocktail journey as well. What I’m particularly happy about is finding talented young bartenders and hospitality professionals that share the same vision as we do in the Curator, nothing makes me happier than building their careers and growing together with their help. Nothing moves forward with respect to our plans without finding more of them.